What could be more uncanny than neat piles of books actually underneath a desk, if not neat piles of books on a decidedly uncanny subject? In this case, automatic writing. 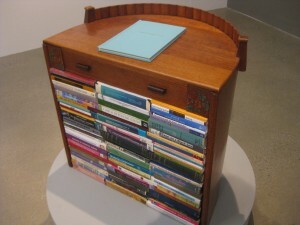 The binder on the work surface contains her postgraduate work on the topic, with an introduction by Susan Hiller. This is the dry, public facing side of the work, the writer and perhaps the artist too. But the subterranean library is where you’ll find the action. Suddenly we have colour. Those books give the sculpture a transgressive energy. They fly in the face of reason. For me, the most unheimlich thing of all was to notice who gave Hiller her first books about Stein. According to her introduction it was Tom Verlaine. I assume that’s the singer and guitarist. His former band Television looms much larger in my imagination than the towering figure of 20th century art and letters to whom this piece is dedicated. Although I probably feel they shouldn’t. Ironic that one of my earliest influences should have found its way into this piece about suppressed artistic sources. Not that I would ever disown my love of that whole New York punk scene. I wouldn’t want to come home to find a poltergeist had bricked up my desk with records, after all. This piece can be seen as part of Susan Hiller: An Ongoing Investigation at Timothy Taylor Gallery until 5 March. See gallery website for more details. You might also read an interview with the artist by Rachel Cooke in the Guardian and this piece about the show at Tate Britain in the same paper by Rachel Withers.